I still struggle with this blog’s identity. 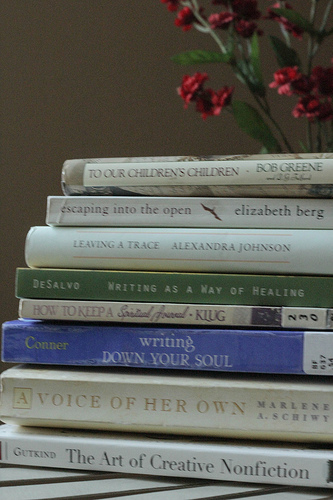 When I started writing about four years ago, I categorized myself as a book blogger. I absolutely loved to read and I thought that writing book reviews (and other such literary posts) would be a way to focus my consistent writing efforts. But then life happened… and while I still love to read, I have learned that I also have other interests that seem to demand a voice. I am grateful to those of you who have chosen to continue to read my feeble words throughout these personal struggles, and I hope to find a rhythm to these posts in the very near future. In the meantime…. here is a literary post that will give you some insight to my current obsession. Can you notice a pattern here? I feel almost compelled to start writing a memoir, or at the very least, a collection of family memories. I’m not quite sure if this is related to turning 50 years old and knowing that I have lived more than half my life – or if it is related to the fact that all the “grandparents” have passed away and I am now matriarch of the family – or perhaps if it has to do with the old adage, “write what you know” and the only subject that I really know is me (or do I? Isn’t the discovery of self a lifetime process? But I suppose that is the topic of a different blog post all together). But whatever the reason, I have an overwhelming desire to start writing memories and I am trying to learn the best way to do that. But at this point and time I feel as though I have read enough. If I am going to write memories then I need to … well… write. Just sit down and put pen to paper (or as the case may be .. utilize the journal writing website Penzu or perhaps the Scrivener writing software). Do I think I have lived a life that others would find worth reading? Absolutely not. My life is about as boring as a slice of white bread… but I harbor the idea that perhaps someday my children – or perhaps my grandchildren – might like to connect to the stories of their past and at this point, I am the only one who can provide that. Am I the best writer for this particular task? Absolutely not. But I am here and I am now and I am willing. I hope to start this endeavor sooner rather than later (that is… tomorrow…) But I know at the very least I will begin the process this summer. I have already enrolled in the July offering of a Spiritual Journaling class at the Iowa Summer Writing Festival … and while I am very much intimidated to share my writing with others, I am also very excited to begin this next step in my writing endeavors. In fact, I am so excited by the prospect of this new adventure that I may even enroll in the Travel Writing course offered in June. I have harbored this dream of writing a travel memoir where the photograph that is “worth a thousand words” is accompanied by an essay of 1,500 words to create a complete short story narrative. How cool would that be: to marry my love of photography, travel and writing into one cohesive project?! Yes, the future is bright and I am excited. Life is indeed good. It's your blog you can do whatever you want on it. I think you're so smart to write memories down – I need to do that as well, especially after I spend time with my mom. Trust me, your family will be thrilled that you are writing about your life. My parents have both done this and it's priceless to me. My mother-in-law just passed away and I so wish she would have done the same. Bravo to you! I once had to give a speech on a famous person's mother. I could hardly find anything! Journal writing, scrapbooks, all those memory kind of things are very important and I wish you great success in getting your thoughts down on paper. YES! At least one of your children & I know Miss Brynn will love it!!!! I think you should write what you want. Don't worry about what the blog started as, growing and changing are part of life. It is definitely a normal growth progression to change, whether it's your blog or your writing goals…or both. It sounds as though your muse is calling for your memories. That sounds wonderful! This sounds like a wonderful project for you and I am sure your family would enjoy reading this and many others too! I love your writing and if you think now is the time then you certainly must do it!!! Yes, go ahead and try the memoirs. Maybe that is your natural writing voice, or at the least, you can experiment with how to tell stories that are memories. I picked up Echoing Silence by Thomas Merton last month. It is an interesting book! I am enjoying it. Thanks so much for writing about it a little while. Did you read it all? What did you think, You could think of your memoir as a spiritual act, and like your commentators said, it will be a true gift to your grandchildren. Molly, just sit down and write your memories! Once you get started you probably will be on a roll. I have often thought myself that I should write down my memories because I am sure that once I write down the first memories that come to my mind, more will follow. It kind of bugs me that I am not able to join any creative writing classes here. I did twice – but after all, it's not English that I'm doing my writing in but German. While still living in Germany I participated in some classes and they were fabulous. I miss that a lot. Perhaps I should explore the German blogland more, I might find an online class!